The Circa Scoop LED is designed to have removable clamps and quick releases, it can be accessorized with a dual road case and a floor base. The Circa Scoop LED isn’t like any other fixture, with a modern twist it is an upscale unit designed to liven up any setting it is used in. 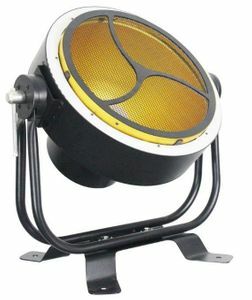 Whether placed on the floor or rigged, this unique fixture can make any band or performer stand out from the rest. The Circa Scoop LED has the design and effects you’ve been looking for, let its multiple elements make you stand out from the crowd!